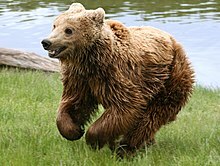 The Eurasian Brown Bear (Ursus arctos arctos) is a subspecies of the Brown Bear (Ursus arctos). It is found across northern Eurasia. It is the national animal of many countries including Finland. Bears are known to attack humans for many reasons but actually they avoid attacking. One reason is that if you surprise a bear it is likely to attack. The other one, is that bears enjoy to eat food, which is why people tend to avoid leaving food in the forest where bears are. Wikimedia Commons has media related to Ursus arctos arctos. Wikispecies has information on: Ursus arctos arctos. This page was last changed on 4 January 2018, at 03:42.